Do Renown abilities trigger with lethal damage? KongMing on Taijic Boros Bad Boys! Heya! I have a Tajic deck too, though I run a different theme. Some of your control spells seem like nonbos with other options in your deck. I'm looking at Aven Mindcensor and Leonin Arbiter with Terramorphic Expanse, Evolving Wilds, Burnished Hart, Sunforger, and Enlightened Tutor. Basandra also removes your ability to cast crucial spells during combat, like Archangel Avacyn, Resurgence, Boros Charm, Deflecting Palm, Swords to Plowshares, Starstorm, and recasting Isochron Scepter's copy during combat. To a lesser extent, there is also Spirit of the Labyrinth with Slate of Ancestry. Removing one half of some of these nonbos for cards that work with the other more smoothly might give you more synergy. I would recommend removing Aven Mindcensor, Leonin Arbiter, Basandra, and Slate of Ancestry. Since you have so much Mentor and other cards that trigger on combat, I'd say adding more combat phases can help you get the win. Aggravated Assault is a good manasink, and can be activated multiple times a turn. Breath of Fury combos with Legion Warboss beautifully - not only do you get a Mentor on each additional combat, you can generate additional combats by sacrificing the Goblin you generate during combat, as long as someone is open. For equipment to add, I have to give Loxodon Warhammer the thumbs up. Not only can it give Tajic Trample and +3/+0, the Lifelink gives you great sustain for hanging on mid-game. You can even equip it to Balefire Liege to gain life from that damage, too. It can also be recurred with Sun Titan, etc. Also, since you have Sunforger already, I'd recommend adding Comeuppance to the deck. It does a great job of helping you not lose the game, which is always good. Teferi's Protection would be another option. Speaking of Sunforger and additional combats, you could also add Godo, Bandit Warlord . I realize a lot of these are already on your Maybeboard, I'm just throwing my support in behind them. Have you considered adding cards that would give Hidestsugu lifelink? Basilisk Collar and Loxodon Warhammer come to mind. Also, Neheb, the Eternal would be nice. Before/during combat phase, you deal damage with Hidetsugu and then after combat, have Neheb generate mana based on that damage and pump it into whatever you want. It's a great alternative in case you don't have access to a damage-doubler. 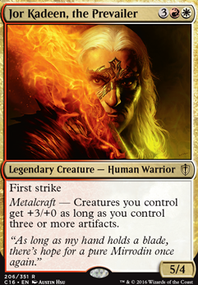 PS: we've been using Neheb as a commander; please check out our deck based on him if you have some time; he's one of our favorite single-color commanders. ManaLocked Yesterday I played a sweet game with this list and am already thinking about improvements and changes. In that game, I developed only lands and bodies on the first couple turns, but got powered up by Joraga Treespeaker and Nissa, Voice of Zendikar (eventually recurred by Eternal Witness ), also featuring a Walking Ballista and Hangarback Walker from turn 2 getting stacked. I recovered my board from a board wipe--powered up by that huge Hangarback Walker and Toothy dying--by setting up another big Toothy, which met Swords to Plowshares. Before getting exiled, Toothy prevented a Niv-Mizzet player from winning by forcing blocks, with assistance from Hardened Scales , and Hadana's Climb Flip flipping into Winged Temple of Orazca. Karn Liberated also put in work to remove a big blocker and Elspeth, Sun's Champion. Eventually I was able to eliminate two players in one turn (including protecting my lethal attackers with both Mystic Confluence and Heroic Intervention ), but not before flying chip damage and a big chunk from Havoc Festival brought me to a low enough life total that a Bosh, Iron Golem was able to finish me off in the same turn. 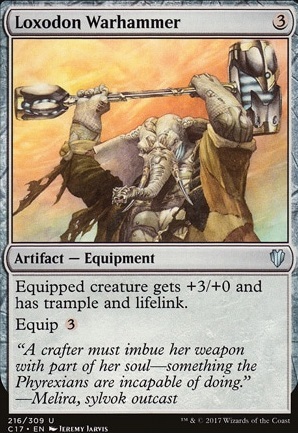 Loxodon Warhammer is a card that comes to mind as a card that I would have loved to have accessed during that game. Granting trample to a big Toothy and getting a big life swing to boot could be useful in many different situations. 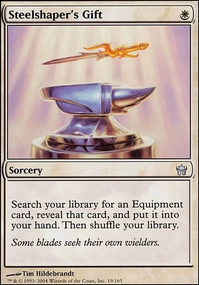 I love that almost any effect from an opponent that causes Toothy to leave the battlefield compensates me with a serious amount of cards: this mitigates the risk of inherent to an equipment like Warhammer, whereas normally it's punished with removal, especially instants. While Warhammer doesn't literally synergize with counters cards, it provides multiple effects that round out the strategy, and is probably the card I am going to add first. 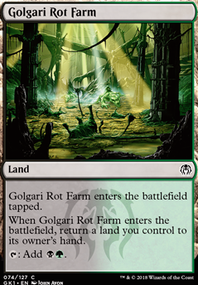 Other notes on artifacts: The first board wipe caused me to forget that I had a tapped Power Conduit hidden among my lands, but somehow I sold how much I still like the card that it traded with a Scour from Existence. 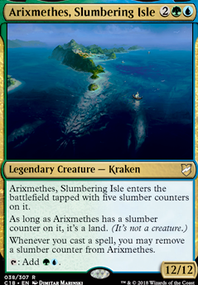 This card is tricky and interesting but it might just be worse than something like a Thought Vessel . I still want to get a feel of how good Throne of Geth is before I can determine whether Tezzeret, Artifice Master is something I want to add: a copy of Garruk, Primal Hunter I had drawn late game felt rather stranded in hand over a rebuilding board, but it has so much more potential for outrageous draws to boost Toothy and my hand, that I like it much more than Tezzeret, especially with this few artifacts to begin with. Neither of Tezz's abilities seem worthwhile enough to risk spend 5 mana on just to have it die to attackers or removal, and this deck might struggle to take advantage of the ultimate as currently constructed. Maybe the superfriends build wants him; I don't think this one does. The deck is also very light on graveyard recursion, running only Eternal Witness. Being a little light on recursion is fine, as the card draw consistency of Toothy is resource advantage enough, but sometimes the best line can be made much better with a card from the graveyard. The top of my list is currently Seasons Past and maybe Elixir of Immortality , both of which also offer protection against decking. Spike Weaver is next on the add list. Holding mana for the fog on it feels bad, but as this ability can mainly be used as a deterrent or political tool, it seems the upside is too good to pass up. I got a copy and am looking for a cut for it. I'll add more to the description soon. This is absolutely currently my pet deck and it even inspired my choice to build The Haunt of Hightower , with the thoughts of placing a Hightower of counters on the commander reminding me of this deck. Thanks for your feedback and good luck to you! Sweet deck, young planeswalker; it seems most formidable. I have a couple thoughts about ways you can totally max out the value in every card in the deck! Basically, I think you want to maximize the chances that all the creatures you have on the field are working together. In general, you want to maximize your chances of game-winning synergy. I think these changes will help smooth out the mana curve, provide reliability to the central combos of the deck, and will add versatility to the things your deck can do in 'edge' cases. 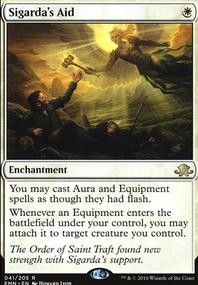 Another cool family of cards to consider is equipment. 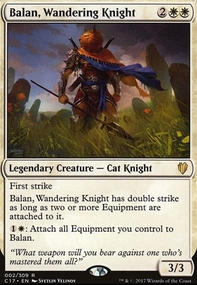 Odiric and knight exemplar could combo really well with Danitha Capashen, Paragon , Puresteel Paladin , Basilisk Collar , Loxodon Warhammer , and other powerful equipment.